The seeds of the Chapman family’s kitchenware business were planted one Thanksgiving when Julie and her mother, Inna, lamented how hard it was to use a garlic press. The family’s engineers, product designers, and cooking enthusiasts put their heads together, designed a better garlic press, and have been creating new products for home chefs ever since. Led by Dean Chapman, CEO of Prepara, the family’s brainstorming sessions have yielded three products that are a perfect fit for entertaining. The innovative Roasting Laurel is a heat-resistant silicone roasting tool that keeps your bird or roast elevated, encourages more consistent browning on the sides, and eliminates sticking. The bendable form lets you mold it to whatever shape you need to keep things upright, or for example, to support fish for steaming. For easy, one-handed basting, the Chef’s Basting Set includes a silicone squeeze brush and a jar that acts as a docking station so it’s easy to extract your oil, butter, sauces or juices. Lastly, the Chef’s Center Cookbook Holder fits cookbooks, magazines, tablet PCs and e-readers. It has a swivel base to keep your recipes in view and a splatter guard to protect paper pages and electronic screens. With the right tools, cooking for family and friends can be even more rewarding. Hello everyone, it’s that time of year for a celebration. We're very excited to share with you some of our newest kitchen tools...perfected to bring your family and guests to the table in a hurry! Our new Roasting Laurel, Chefs Basting Set, and Chefs Center Cookbook Holder are all designed to enhance your dining experience and give you the tools needed for the perfect meal. You indicated on the video these were American made products, but at the bottom of the product descriptions it says, Made In China. I'm confused, I would buy the product if made in the USA . . .
Hello and thank you for your note! You may wish to view the video again as we make no such claim. We do say that our products are designed in the USA by our design team, which is 100% factual. And you are correct, the products are made in China at factories we have long standing realtionships with. I hope you change your mind as these items are truly unique and quite useful in your kitchen...and mine! I have an African Grey Parrot and I am always concerned about products that get hot, like non-stick pans. Are these silicone products safe for birds and not give off toxic fumes? Our Roasting Laurel is made from high quality silicone and meets / exceeds all FDA standards. In fact, we even meet the more stringent European standards that are currently in place! You and your African Grey Parrot should have nothing to worry about! Thanks for your note and Happy Thanksgiving! @Russ Johnson Greetings! Who has ever heard about synthetic Basil?!!! Could you give more explanation about this product? Thank you! The Roasting Laurel is designed to pefectly compliment our healthy lifestyle brand statement by allowing you to elavate your foods away from unhealthy or unwanted fats and grease. The Laurel also promotes even cooking and browning and easily cleans up in the dishwasher, unlike most roasting racks that require lots of scrubbing. The Laurel also fits virtually all roasting pans because of it's flexability. It is oven safe to 500 degrees and can be used for various cuts of meat, poultry, fish, or veggies. It can also be used as a trivet or cooling rack. Truly a one of a kind item! We all love it and I hope you do too! Hey, where's that garlic press? Ahhh yes...one of our favorites, but not part of this feature today. Sorry! As you probably know the ratcheting action of the Garlic Press is designed to eliminate the amount of energy / force needed to crush garlic. Designed just like a ratchet wrench. You can crush multiple cloves with ease without having to remove the skins first! 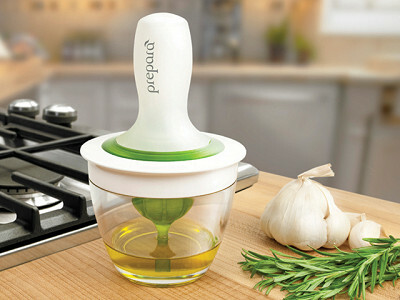 The Garlic Crusher is GREAT if you suffer from arthritis or have any weakness in your hand. Thanks for bringing up one of our favs! At first I thought they were made in the USA and I was ready to buy, but then I found they are made in China. That's too bad. Great idea though! Thank you for the "nice idea" kudos! But, can you tell me why you will not buy our product since it is made in China? I really don't understand. @Russ Johnson The more we buy from China the less work we have ,in time we will not have Money to buy anything .that makes so much sense to me . IT IS SO SAD THAT AMERICAN'S WOULD RATHER SUPPORT CHINA, JAPAN, AND OTHER COUNTRIES AND NOT THEIR OWN!!!! @ ROSA You are so RIGHT. @ Elisabeth Mestlin Buying American is SO important, especially in our economic times. Although I was looking at this product for "stocking stuffers," I changed my mind when I saw where it was manufactured. @Elisabeth, @ Dee, @Rosa & @Donna Thomson: Russ and our other Grommet Partners would prefer to make the products in USA. However, the US does not have all the available manufacturing capabilities in many product advances and technologies, at least at this time. 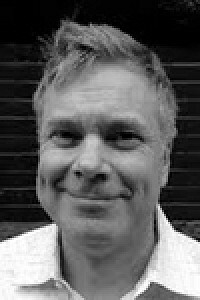 We see territory being regained there every year, and I am sure that Russ will be watching carefully to pull production over to the USA when and if it becomes available. Proceeds of a purchase will go to the retailer (Daily Grommet in this case!) and we are all very grateful when you purchase the discoveries that we share with you. It's what keeps Daily Grommet going and our team employed. Another piece of the revenue will go to Russ's US team. So don't think that your purchase of a non-USA made product only keeps non-USA folks employed. I'm waving my hand as one of the Americans who will stay employed by your purchases. BTW, Prepara's products are designed in the US by Russ' design team, employing even more Americans. We have a large assortment of Made in the USA products that you can check out too. And of course, let us know if you come across any great new products made in USA here. I am personally offended by your remarks (and others) which seemingly paint me / my company as un-American. You do not know me. You do not know my Company. I feel your words are unfair, and to be honest, a bit hurtful. But since you do not know me or my company, let me give you a little insight as to who I am and what I'm about. I believe in God. I believe in family. I beleive in this great Nation. I am the son of a man who is part of the Greatest Generation. My father proudly served our Country as a medic. He was part of the first wave at Utah Beach during the invasion of Normandy. He was twice wounded in battle. He was the recipient of the Bronze Star for valor. He is now burried at Arlington. My dad inspired me. He taught me to love our country. He taught me right from wrong. He taught me respect. Rosa, I would never do anything to dishonor the memory of my father and dishonor the Country he loved so much. Maybe now you have a slightly better understanding of who I am and what I stand for. While I'm not perfect, the one thing I'm not is un-American. So yes, our products are manufactured in China, like so many other goods. I'll bet the computer you just used is made in China. The same with the phone you have. And the same with your TV, but yet you have chosen to buy these items. Manufacturing our products in China doesn't mean we're un-American. Far from it. It basically tells you that this is the best choice from an economic standpoint. We have studied the possibility of making goods in the US, however at the end of the day the products become too expensive for the consumer to support. Trust me. As a guy who loves his country I would like nothing more than to see our goods manufactured domestically at a reasonable cost. But currently this is truly impossible. I hope I have been able to give you a better understanding of who I am and why we make goods abroad. But most of all, I do expect an apology. Can I use the laurel in the crock pot/slow cooker? Yes! The Laurel is perfect for your crock pot or slow cooker. But you do need to make sure your temperature does not exceed 500 degrees. If your unit has multiple temperature settings, probably best to use on low or medium. I am in love with this silicone wreath and have added it to my "want" list. I will most likely buy it this Friday. I have already come up with about 7 different use ideas for it, so I am beyond excited. Thanks for being creative and coming up with wonderful ideas that fit the non-professional chef and at home cook's budget. I wish you nothing but continued success in your exciting venture. Thank you so much for your ultra positive response! There's so many uses for the Laurel it's hard to list them all. You have 7...would you mind listing for everyone? Enjoy theLaurel. It really is a great product!! 3. To create a flavor pit for casseroles where I can divide what is being cooked into three different dishes within one dish. (If it does not make sense, feel free to email me. I believe you have my contact information. 6. To hold in certain baked goods so that they go up and not out like certain cookies do. 7. To hold the next "tortilla" when I am making spring rolls, since I am sure that I can wet it, but yet the "tortilla" will remain aloft from the others, ready to be filled with goodies. Those are the seven I have so far. The seeds of the Chapman family’s kitchenware business were planted one Thanksgiving when Julie and her mother, Inna, lamented how hard it was to use a garlic press. The family’s engineers, product designers, and cooking enthusiasts put their heads together, designed a better garlic press, and have been creating new products for home chefs ever since. Led by Dean Chapman, CEO of Prepara, the family’s brainstorming sessions have yielded three products that are a perfect fit for entertaining. The innovative Roasting Laurel is a heat-resistant silicone roasting tool that keeps your bird or roast elevated, encourages more consistent browning on the sides, and eliminates sticking. The bendable form lets you mold it to whatever shape you need to keep things upright, or for example, to support fish for steaming. 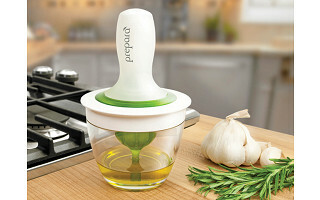 For easy, one-handed basting, the Chef’s Basting Set includes a silicone squeeze brush and a jar that acts as a docking station so it’s easy to extract your oil, butter, sauces or juices. Lastly, the Chef’s Center Cookbook Holder fits cookbooks, magazines, tablet PCs and e-readers. It has a swivel base to keep your recipes in view and a splatter guard to protect paper pages and electronic screens.